← Breaking News! Badass route as hellish as ever! Remember we told you that Birdy Brow culminates in a series of tiresome rollers that trend upwards along the southern side of Longridge Fell? Eventually you’ll hit a T-junction by the New Drop Inn and turn right. This is where the last little bit of ascent over the top of Longridge Fell begins. At over 900 feet in height at the top you’ll be able to check out the lie of the land, and see the terrain left to cover. On second thoughts, don’t bother. You’ll have had enough pain for the day. We stuck a van on top of the Fell last year for those who were running low on water and glucose. With 30 miles left to pedal and the heavens opening in a thunderous downpour, it was a welcome sight to all those sorry-legged Badasses who crawled up over the hill’s cold shoulder. One local entrant was even reduced to sheltering in the back of the van, mewling piteously like a kicked kitten, and then skanking off with JD’s rain jacket because he had “forgotten” his own one. The steep descent off the Fell and down Jeffrey Hill on the other side has a sharp, dogleg turn where it would be exceedingly easy to kill yourself if, for example, you were descending at speed having cycled for far, far too long a distance and were running perilously low blood sugar levels. Take it easy. You’ve come this far…why end it here? 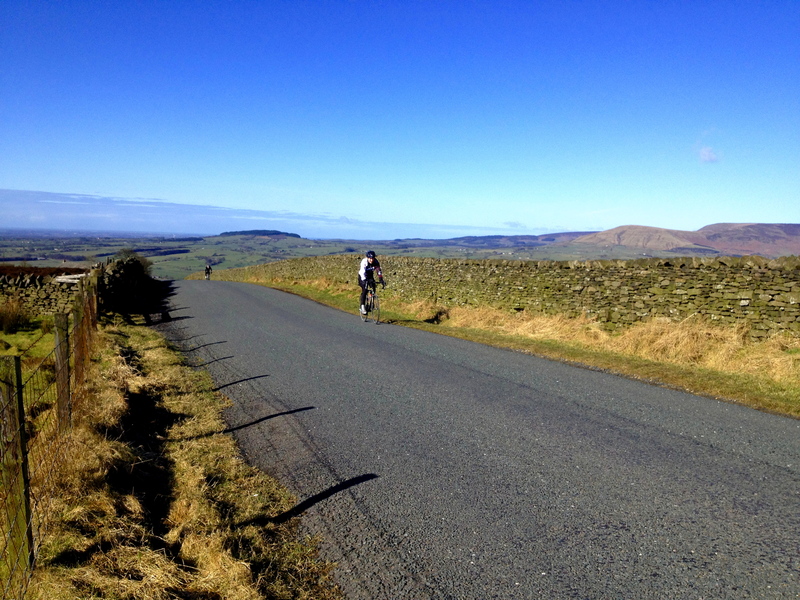 Posted on May 18, 2013, in Bowland Badass Climbs and tagged bowland, Bowland Badass, Bowland Forest, Bowland hills, Longridge, Longridge fell. Bookmark the permalink. Leave a comment.